On his fourth LP, Shugo Tokumaru's jubilant bedroom pop proves to be a bit too much of a good thing. In the summer of 2006, I ducked into a small, subterranean club in Tokyo's Yoyogi neighborhood, excited to finally see one of my favorite new songwriters perform live. When I approached Shugo Tokumaru at the merch table, he seemed a bit taken aback. It was as if he couldn't comprehend how a foreigner might know of him, let alone attend one of his shows. The feeling of disbelief was more than mutual. How had a musician and songwriter of such obvious talent remained virtually unknown outside of his homeland for so long? Released in 2005, Tokumaru's L.S.T. felt in many ways like a Japanese counterpoint to so much of the indie-pop then making waves in America, namely the elaborate folk-pop of Sufjan Stevens and lo-fi constructions of Jens Lekman. As I told many friends in those days, had I run my own record label, my first order of business would have been to put out Tokumaru's albums stateside. Seems like I wasn't the only one who felt that way. Five years later, Tokumaru's prospects here in America look very different. He finally has support from a sizable US label, he has toured the East Coast with the Magnetic Fields and has further plans to tour the US and Europe extensively in 2011. Back in his homeland, Tokumaru is now a top-selling artist, having reached a much wider audience after allowing Sony to use his 2009 single "Rum Hee" in a computer commercial. That same year, he sold out all 13 dates on his first Japanese tour, receiving a hero's welcome in cities where his albums hadn't even been available one year prior. Still, as much as Tokumaru's situation has changed during the last few years, his songwriting hasn't strayed. While contemporaries like Stevens and Lekman have long since moved on, exploring electronic textures, sampling and orchestral compositions, Tokumaru's work remains firmly rooted in the gentle folk-pop aesthetic he first sketched out on 2004's Night Piece. Employing various stringed instruments (guitars, banjos, ukuleles, mandolins), toy pianos and bells sets, Tokumaru continues to sculpt twinkling, cheerful pop melodies with a painter's eye for detail. As accomplished as these compositions are, however, one has to wonder if indie-pop fans -- much like Tokumaru's contemporaries -- have since moved on? To be fair, Tokumaru hasn't completely failed to evolve. Port Entropy finds the songwriter continuing to refine his sound, inching ever closer to pop's platonic ideal. While previous releases had a mildly experimental bent, dabbling in dissonance and non-linear song structures, Port Entropy largely jettisons such ideas, embracing more straightforward melodies and forms with an eye toward sonic maximalism. The end product is an unapologetically pretty, even precious, sometimes dazzling record. "Platform" slowly builds from a banjo-packing porch-sit into a clattering swarm of keys, strings and whistles. "Lahaha" is a sugar rush of manic guitar strums, driving percussion and joyous laughter. And "Rum Hee", Tokumaru's biggest Japanese hit to date, absolutely teems with life; an impeccably crafted three minutes of giddy pop bliss. By its second half, Port Entropy starts to drag, the result of too many songs that draw from the same, limited emotional range. Stargazing, overly dense tracks like "River Low", "Drive-Thru" and "Suisha" crowd the album's midsection, overwhelming the listener as they tilt the balance a bit too far toward the children's section. That's a shame because as a few of the songs here demonstrate, Tokumaru is fully capable of writing with poignancy and depth. "Linne" stands as Port Entropy's most striking cut, a spare lament that finds the songwriter alone at the piano until halfway through, when wisps of spectral singing saw begin to creep in at the song's edges. The equally hushed "Orange" adds a vaguely sinister dimension to Tokumaru's sound, employing an out-of-tune toy piano and wheezing accordion to craft what sounds like a funeral dirge played on dusty antiques. 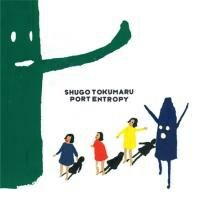 While Port Entropy contains some of Tokumaru's most accomplished compositions yet, on the whole, it's a bit too monochrome for its own good. Though only 37-minutes long, the album starts to feel tedious before reaching its conclusion, its songs bleeding together in a saccharine haze. This is especially disappointing when one considers Port Entropy alongside Dustin Wong's recent LP, Infinite Love, which in some ways, feels indebted to Tokumaru's frantic delivery and six-string prowess. Despite the fact that it's wholly instrumental and far more stripped down--Wong's songs are built mostly from guitar loops--Infinite Love manages to feel more dynamic by a mile. In this case, it's Wong's willingness to draw from a richer emotional palette that keeps things engaging, capturing the listener's attention even without aid of lyrics or vocals. Perhaps there's a lesson in the comparison for Shugo Tokumaru: sometimes less really is more.